When Brittany (The Book Addict's Guide) and Andi (Andi’s ABCs) announced that they were hosting this statistics survey, I debated for all of one second before deciding I was definitely IN. I never tire of end-of-the-year surveys (or any other survey, if I'm being honest. For example, see this post and this post.) and am excited to geek out over bookish statistics with them. So here it is, my Statistics Survey! 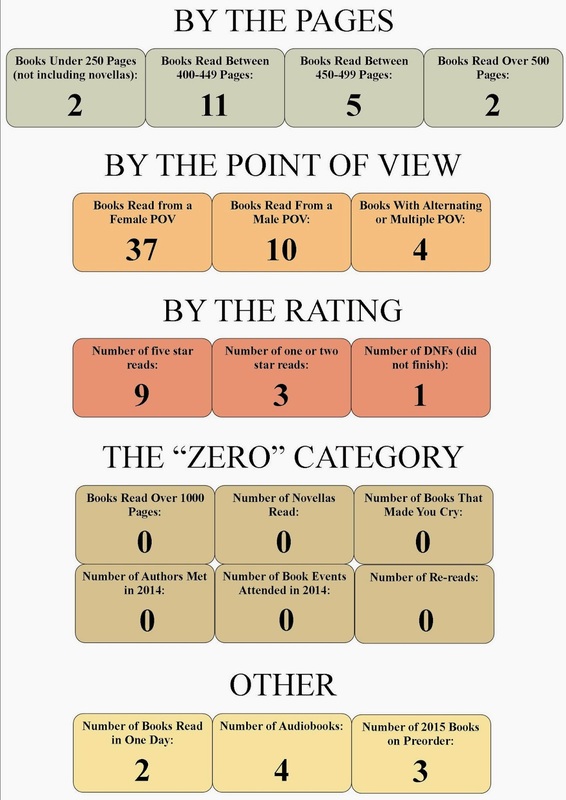 Note: These statistics reflect books that I read in 2014 (not books published in 2014 only). Book with the highest rating on Goodreads: Heir of Fire by Sarah J. Maas and Golden Son by Pierce Brown are both currently rated at 4.61 on Goodreads! Book with the lowest rating on Goodreads: The Love Affairs of Nathaniel P. by Adelle Waldman is rated 3.31, which surprises me since I thought it was a really solid and thought-provoking novel. Book read furthest away from home (vacation reads? ): I read Of Metal and Wishes by Sarah Fine in Mexico! Book that took you the longest to read: Star Crossed by Elizabeth C. Bunce took me weeks to read. I had the hardest time getting into that book. Book that made you love the villain: Ruin and Rising by Leigh Bardugo. DARKING ALL THE WAY BABY! Book you said you’d come back to but still haven’t picked up again: Goblin Emperor by Katherine Addison. Book you read waaaay before it’s publication date: Well, not WAAAAY before, but I was lucky enough to get an ARC of Golden Son by Pierce Brown. Which was awesome. Book you read on your birthday: The Storied Life of A.J. Fikry by Gabrielle Zevin. Book with a character who shares your name: None! Book you weren’t entirely truthful about when rating (Fluff up any ratings? Rated even though you didn’t finish? ): I work really hard to be honest in my ratings, so, happily, I don't have an answer to this question. Book you read in 2014 but already want to re-read: Fangirl by Rainbow Rowell and After I Do by Taylor Jenkins Reid! Book by a foreign author/originally published in another country: The Ruby Red Trilogy was originally written in German! Book you which you could go back and read for the first time again: Fangirl by Rainbow Rowell! And The Kiss of Deception by Mary E. Pearson! So deliciously fabulous, those books. Most books read by one author this year: Sharon Shinn (3), Rainbow Rowell (3), and Kiera Cass (3)! Most lenient & harshest ratings: I always try to be honest, so whether its lenient or harsh, I give books the rating I feel they deserve! Book that has the letters Q, X, or Z in the title (bonus for one of the words in the title beginning with those! ): None! Yikes! Book that suffered some damage this year (food? water? ripped pages/cover? Ouch! ): None of my books, but my 2-year-old's books have certainly seen their share of wear and tear! Food you craved while/after reading a certain book: I didn't love Anna and the French Kiss by Stephanie Perkins, but I won't deny that that book made me reeeeeeally want French food. BADLY. First post of 2014: Happy New Year! Post with the most comments: My post on the Top Ten Book Covers I Would Frame as Pieces of Art. Post you wish you could re-write: Nothing immediately comes to mind, but I sometimes wish I could rewrite my reviews. Great post. I love looking at all the books broken down like this. Thanks! Glad you enjoyed, I loved writing it. Love this. This is a lot of fun. I'm curious why you abandoned the Anna and the French Kiss series? Which ones did you read? Did you just not like Perkins's writing? Thanks, glad you liked reading it! I have an analytical personality, so this kind of thing is really up my alley. But I'm excited to check out your post on books you're anticipating this year! There's something to be said for looking forward instead of looking back.